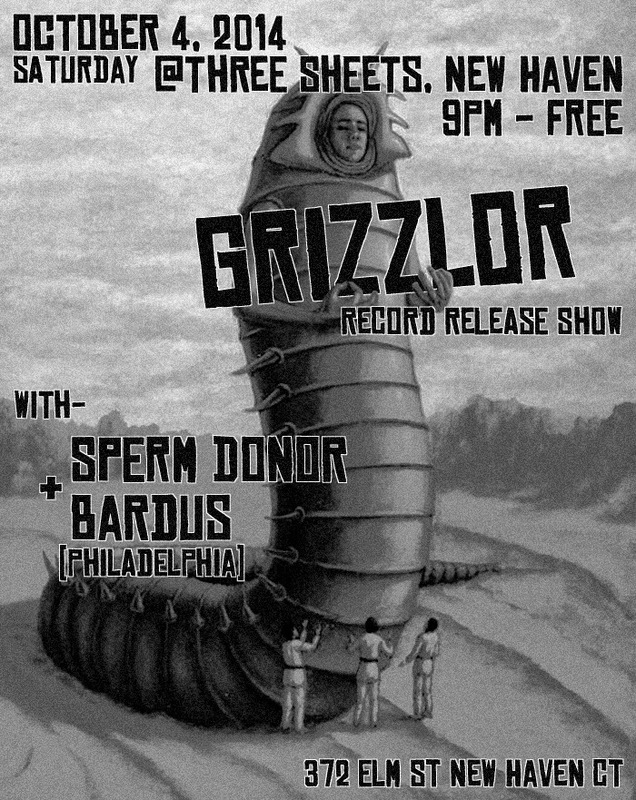 GRIZZLOR is releasing a 4 song 7 inch on Saturday, and playing a release show @ Three Sheets New Haven! 10/4 marks the local release of GRIZZLOR's first EP on Money Fire Records, "When You Die". 4 tracks on 45rpm 7" vinyl. We're happy to have Sperm Donor and Bardus from Philadelphia playing along with us - two of the heaviest/beefiest bands known to mankind. Loud music, vinyl, t-shirts, booze? Now as for the EP, I got to take a sneak peek at it with my ears and it's everything you've come to love and expect from GRIZZLOR. "NO TIME" starts up at its peak ferocity with absolutely no relenting until its end. Mean bass and guitars and unhinged shouting/hollering vocals at their brutal best. "PLASTER COWBOY" is an uptempo fever dream. It feels mechanical, like a car going at top speed. This band doesn't EVER give you a break from enduring their mightiest most powerful sounds. Side B opens with "STONED" which is slower in tempo but makes up for it by being not one bit less ferocious and intimidating than the previous tracks. Dark and foreboding with an undeniably catchy beat. "MINI SPACESHIP" sounds more on the... fun? side of GRIZZLOR, as in it seems playful. Playful in the way cats can be with mice they eventually intend to kill. It's still very riff heavy, huge and mean. It also carries all of the sonic qualities of the other 3 songs in this perfectly assembled set. These songs fit well together and this band is steadily growing into a beautifully grotesque beast.